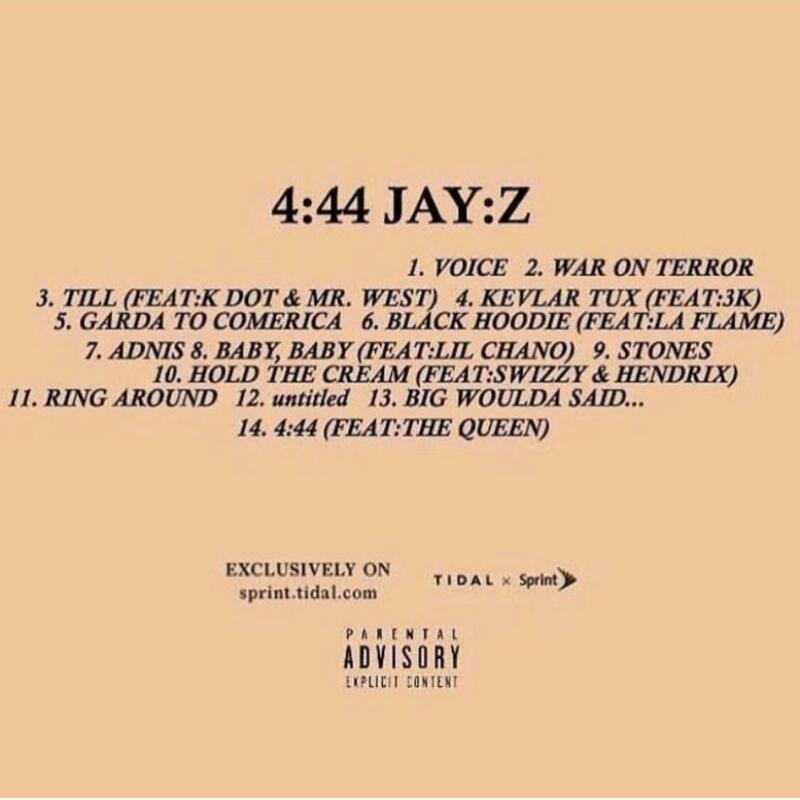 4:44 este cel de-al 13-lea album al lui JAY-Z și a fost lansat în data de 30 iunie 2017, prin Roc Nation. 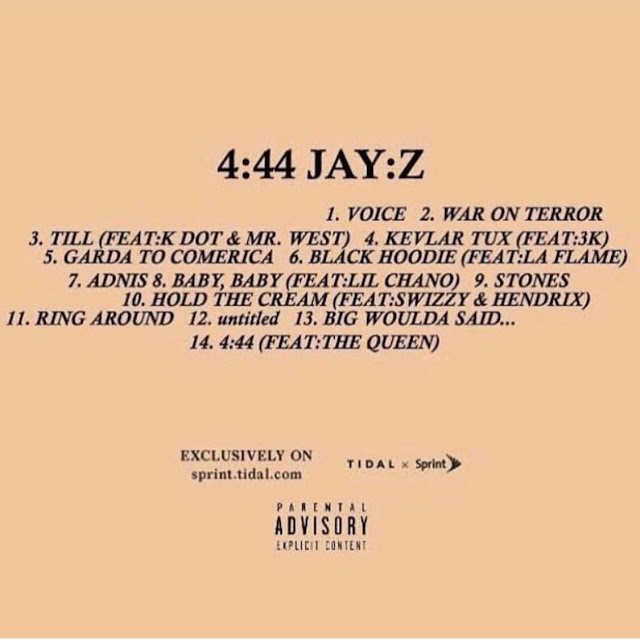 "4:44" features additional vocals by Kim Burrell. "Family Feud" features additional vocals by Beyoncé. "Marcy Me" features additional vocals by The-Dream. "Legacy" features additional vocals by Blue Ivy Carter. 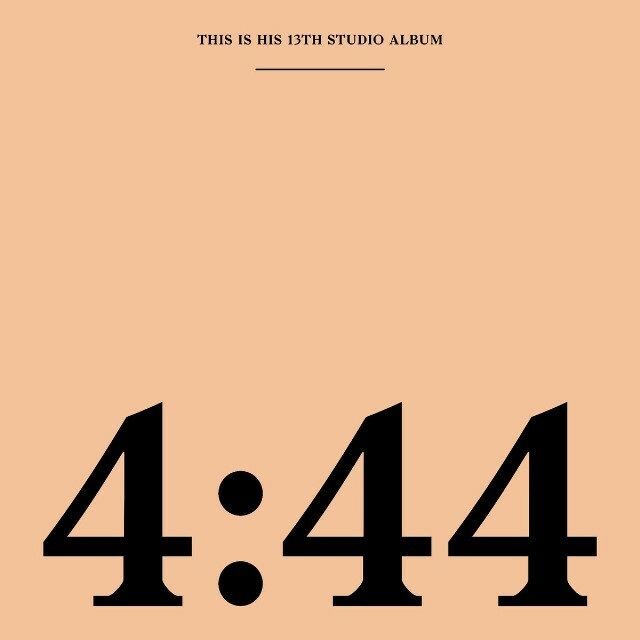 "Kill Jay Z" contains a sample and portions from "Don't Let It Show", written by Alan Parsons and Eric Woolfson and performed by The Alan Parsons Project. "The Story of O.J." contains elements and excerpts from "Four Women", written and performed by Nina Simone and "Kool Is Back", written by Gene Redd and Jimmy Crosby and performed by Funk Inc.
"Smile" contains elements and excerpts from "Love's in Need of Love Today", written and performed by Stevie Wonder. "Caught Their Eyes" contains a sample and excerpts from "Baltimore", written by Randy Newman and performed by Nina Simone. "4:44" contains a sample of "Late Nights and Heartbreak", written by Kanan Keeney and performed by Hannah Williams and The Affirmations. "Family Feud" contains portions of "Ha Ya", written by Elbernita Clark and performed by The Clark Sisters. "Bam" contains elements from "Bam Bam", written by Winston Riley and Ophlin Russell and performed by Sister Nancy and elements from "Tenement Yard", written by Jacob Miller and Roger Lewis and performed by Jacob Miller. "Moonlight" contains a sample from "Fu-Gee-La", performed by The Fugees. "Marcy Me" contains elements from "Todo O Mundo E Ninguém", written by José Cid and Tozé Brito and performed by Quarteto 1111. "Legacy" contains a sample and excerpts from "Someday We'll All Be Free", written by Donny Hathaway, Edward Howard and performed by Donny Hathaway, and portions of "Glaciers of Ice", written by Dennis Coles, Robert Diggs, Elgin Turner, and Corey Woods.